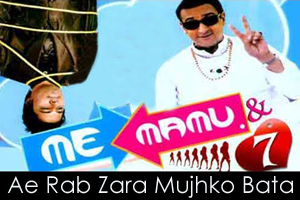 Lyrics Of Ae Rab Zara Mujhko Bata From Movie - Me Mamu & 7 (2011): A Love song sung by Amit Hotchandani and Music has been Composed by Sanjay and Vishal. The Audio of this song is available on Youtube at the Channel music centered station. The Audio is of 4 minutes and 05 seconds duration. Lyrics of "Ae Rab Zara Mujhko Bata"
Lyrics in Hindi (Unicode) of "ऐ रब जरा मुझको बता"